This Slow Cooker Chicken and Stout Stew is so rich and delicious with earthy mushrooms, sweet carrots, bacon and tasty stout beer. Peas added right before serving stay fresh and green. Serve this over rice, polenta or pasta to soak up all the flavorful broth. 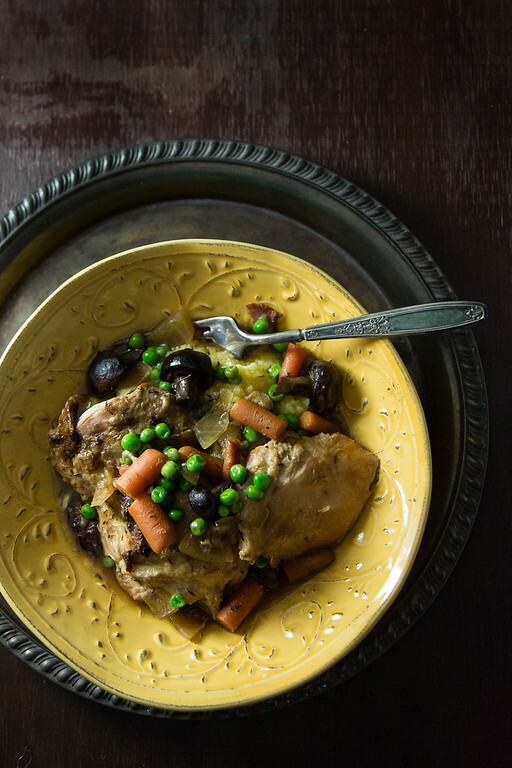 Click here to pin this Slow Cooker Chicken and Stout Stew now! Have you discovered how wonderful it is to cook with beer? Beer adds an earthy richness to recipes. Any beer will add flavor and depth, but I really love using a stout in winter stews and soups. A stout beer is a dark beer with coffee chocolatey flavor. It pairs beautifully with beef and chicken and it’s even used in some desserts. For this recipe I used a Guinness Stout. You may be wondering if alcohol cooks out in a slow cooker. The consensus seems to be that it does. The longer cooking time is enough to cook off the alcohol. If you are concerned, you can leave the lid off during the last half hour. Chicken Thighs – boneless, skinless. Can substitute chicken breasts, but thighs stay more moist. Stout – Guiness or other stout. Carrots – I used baby, but whole carrots can be cut to size. Mushrooms – cremini, baby bella, or button will work. Baby peas – can use regular peas. Thaw if frozen. I admit it, I sometimes don’t do the extra steps in a slow cooker recipe. The browning. The deglazing. However, for this recipe, you really need to do the extra steps. They don’t take long and they add so much flavor. The chicken is dredged in flour and browned. Then bacon is added to the skillet and more flour. After that, you pour in the stout and scrape up all the browned bits. I think all of those steps add some crazy good flavor, plus the flour helps thicken the rich broth. This recipe is such a winner. It was fabulous the first night and even better as leftovers. The broth is amazing, I would suggest serving this over rice, polenta, pasta or potatoes. 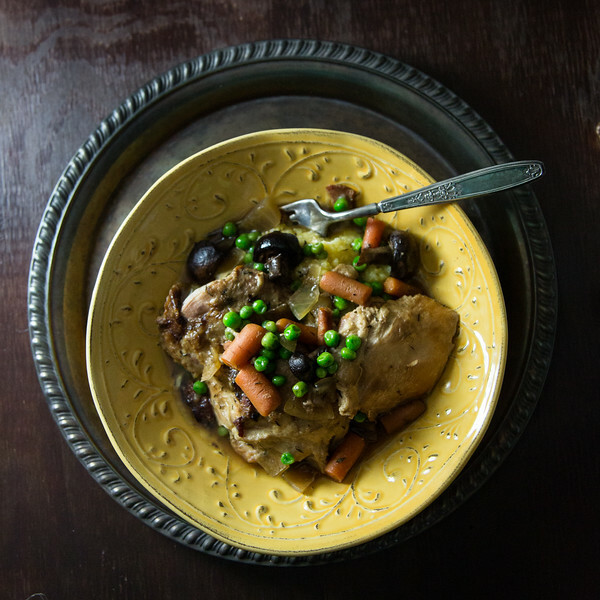 If you make this Chicken Stew with Stout, be sure and let me know what you thought! Slow Cooker Chicken and Stout Stew cooks all day in your slow cooker and is so warm and comforting. Combine the flour with a 1/2 teaspoon each of salt and pepper. Dredge the chicken thighs and set aside on a platter. Heat 2 teaspoons of oil in a skillet over medium-high heat. Add half the chicken thighs and brown about 4-5 minutes per side. Place in slow cooker. Turn the heat down to medium, add 2 more teaspoons of oil and brown the rest of the thighs in the same manner and add to slow cooker. Add the bacon to the pan and cook stirring often. Add the rest of the flour (1/2 cup) to the pan and stir for 2 more minutes. Pour in the stout and use a wooden spoon to scrape up the brown bits. Pour this over the chicken. Add the carrots, mushrooms, onion, garlic and thyme and spread over the top of the chicken. Pour over the chicken broth. Cover and cook for 7-8 hours on low. About 10-15 minutes before serving, stir in the peas. Add 1/2 teaspoon of salt and pepper. Serve over polenta, rice or noodles. Chicken Thighs - boneless, skinless. Can substitute chicken breasts, but thighs stay more moist. Stout - Guinness or other stout. Carrots - I used baby, but whole carrots can be cut to size. Mushrooms - cremini, baby bella, or button will work. Baby peas - can use regular peas. Thaw if frozen. could this be cooked in an instant pot? Yes! I would cook it at high pressure for about 8 minutes, then let pressure release naturally for 10 minutes, and then do a quick release. I’m longing for the kind of weather that suits a heartwaming dish such as this. I love a good hearty stew, especially in the winter!!! This looks delicious and your photos sure make me hungry! I’ll be making this soon. I’m not a huge soup fan but this stew doesn’t look all soupy, which I like, not so much broth or liquid. Yes, it’s the perfect stew! OMGoodness does this look absolutely delicious! Cannot wait to make this tomorrow, have all the ingredients I need already! Yay! This sounds like the ultimate hearty winter stew! We all need some excuses to buy stout! I just pinned this! Looks amazing. I want to try it this week. I’ve cooked beef with stout before but never chicken. 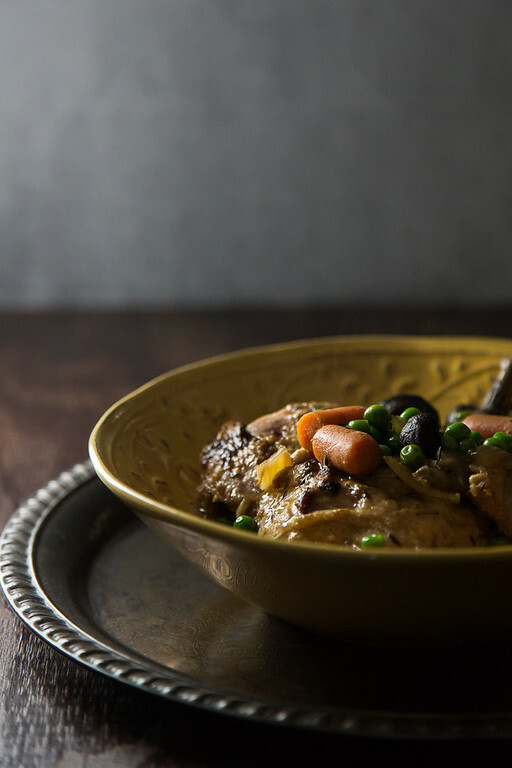 Your Slow Cooker Chicken and Stout Stew looks amazing, Pam. I definitely need to give this recipe a try! Scheduled to share on Pinterest and also on our Hearth and Soul Facebook page later today. Thank you for sharing with Hearth and Soul. Hope to ‘see’ you again this week! I see that in my future. Sounds delicious. Not the same old chicken. Love your photography here also Pam..beautiful deep tones and wonderful composition…Now off to print the recipe…thanks so much for sharing. This looks so cozy and warmly satisfying. Love the photos too! I love stout in recipes (and always leave a bit on the side to drink as I cook:). With the cold weather, this looks like the perfect dinner, with a loaf of great bread and a salad. That’s a tasty dish, heartwarming and comforting.